Bernardo Bertolucci, Novecento ile 5 saatlik bir destan yazıp Robert De Niro, Gerard Depardieu ve Dominique Sanda'nın da muhteşem performanslarıyla birlikte kusursuz bir başyapıta imza atıyor. Absurdly self-indulgent and heavy-handed, but to it's credit it's sheer excessiveness ensures that it's rarely ever boring even at it's ridiculous length (which still isn't to say it couldn't have been shorter, because well of course it could). At the very least Bertolucci and Storaro shoot the hell out of it, as always. Donald Sutherland and the other fascists are such cartoonishly evil villains that it often becomes hard to take the film seriously, as painfully earnest as it's politics are. Stomach churning like the best soviet propaganda. At five and a half hours, it seems to go nowhere, like the director got a blank check and decided to indulge himself and blow it spectacularly. Camera is consistently wonderful, locations, general production is there to see and marvel, but it's bloated hot air, and that whole ending is incredibly silly for such a circunspect, Big-Themes picture. A mass of picturesque shots some controversial scenes and some ridiculous political themes,apart from that not a lot in 5 hours of this film, but for some reason you keep watching. At times, Bertolucci's epic reaches moments of visual beauty, and while the screenplay is often simplistic and maudlin, it's never dull. 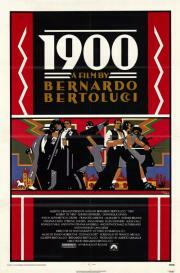 Still, most of 1900 comes off as a bad Godfather homage, and the inclusion of De Niro, in a much broader role, doesn't help the comparison.